Gigaspark Review 2019: Is Gigaspark a Good Hosting? Gigaspark has a straightforward yet robust catalog of web hosting and VPS products available. It caters to individuals and small businesses that want a simple and reliable hosting solution at affordable rates. Gigaspark is another one of those web hosting success stories: it was founded back in 2004 by a group of friends working out of their university dormitory. The company is based in Ljubljana, Slovenia, with a data center in the same country. You’ll find straightforward shared hosting, VPS, and domain registration services here. Although Gigaspark is still a relatively small company, it’s quickly growing: it now serves over 3,000 customers and claims to be one of the top 10 providers in Slovenia. Gigaspark’s website is available in a number of languages via a translation plugin, although Slovenian is the company’s primary language. Gigaspark offers rather straightforward web hosting and VPS hosting products. But this is not necessarily a bad thing as we prefer something simple but polished (as opposed to a bloated service that’ll soon fall apart). With the storage and bandwidth given, you’ll have more than enough to run a decent-sized website on Gigaspark’s limited plans. If you’re worried about exceeding these caps, the company also offers packages with unlimited resources. Shared hosting accounts run on Plesk, which is one of the top two industry-standard control panels. Developers have decent control with access to databases, phpMyAdmin, log files, .htaccess, and a DNS manager. However, Gigaspark doesn’t provide SSH access, and cron jobs are only available with higher-tier packages. With a shared hosting plan, you’ll also have a complete email hosting service with antivirus and antispam protection, POP3/IMAP and SMTP support, a web client, and autoresponders. There isn’t any website builder available, but you can install a good number of third-party scripts and CMSes using Plesk. Gigaspark also offers a few VPS packages that are slightly limited in resources but are still good value for money. These give you root access and a good selection of control panels such as cPanel, Plesk, VestaCP, and so on. Although Gigaspark advertises 99.9% uptime, this claim doesn’t come with a guarantee. However, based on data from independent sources, it does seem like Gigaspark’s servers average well over 99.99% uptime. 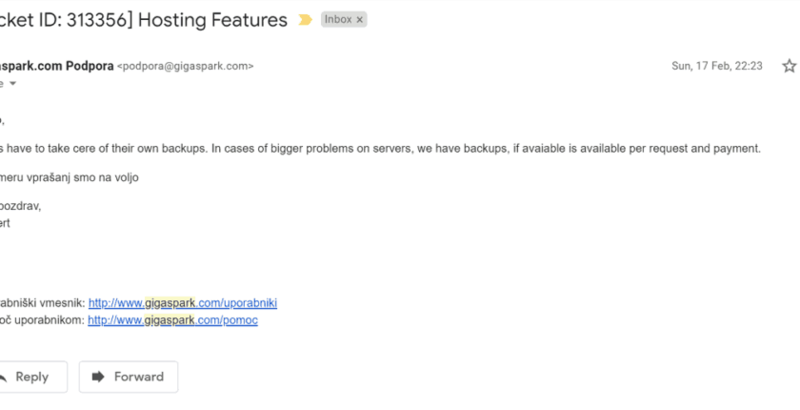 If you want to try out Gigaspark before committing, the company offers free hosting with a tiny 10 MB of storage if you purchase a domain. This is just enough to create a static website with a few images, but don’t expect anything more than that. That said, Gigaspark’s web hosting packages are reasonably priced; just watch out for special rates with higher renewals. You’ll get generous amounts of storage and bandwidth for the price you pay, and unlimited resources from the third plan onwards. These shared hosting plans also include SSL certificates, email, and Plesk, although you won’t get a free domain. The downside to these low prices is that billing only comes with yearly terms or longer. If you’re looking for a low-commitment plan, you’ll have to look elsewhere. All purchases at Gigaspark are also backed by a 30-day satisfaction-or-your-money-back guarantee. You can pay via PayPal as well as leading credit cards. First of all, Gigaspark’s knowledge base is excellent. It’s fairly well-organized under different topics and covers all the most important aspects of their hosting. When it comes to live one-on-one support, the only bad news is that they don’t provide live chat support. However, email and phone support are available — just know that if you’re calling them for tech support, their phone line is only available during business hours. Gigaspark proves that sometimes it’s better to set modest goals and then exceed them than to shoot too high and miss. The company’s basic hosting solutions deliver both performance and most of the must-have features while remaining affordable to most. What you see is what you get with Gigaspark packages — get straightforward hosting here. Wondering how Gigaspark stacks up against other Web Hosting companies? Enter any other Web Hosting company and we will give you a side-by-side comparison.